FULTON, NY – 200 bowlers will have a chance to try their luck on the lanes and raise money to fight homelessness at OCO’s 12th annual bowling tournament. Oswego County Opportunities’ “Lucky 13” Bowl-A-Fun is set for April 13, at Lakeview Lanes in Fulton. 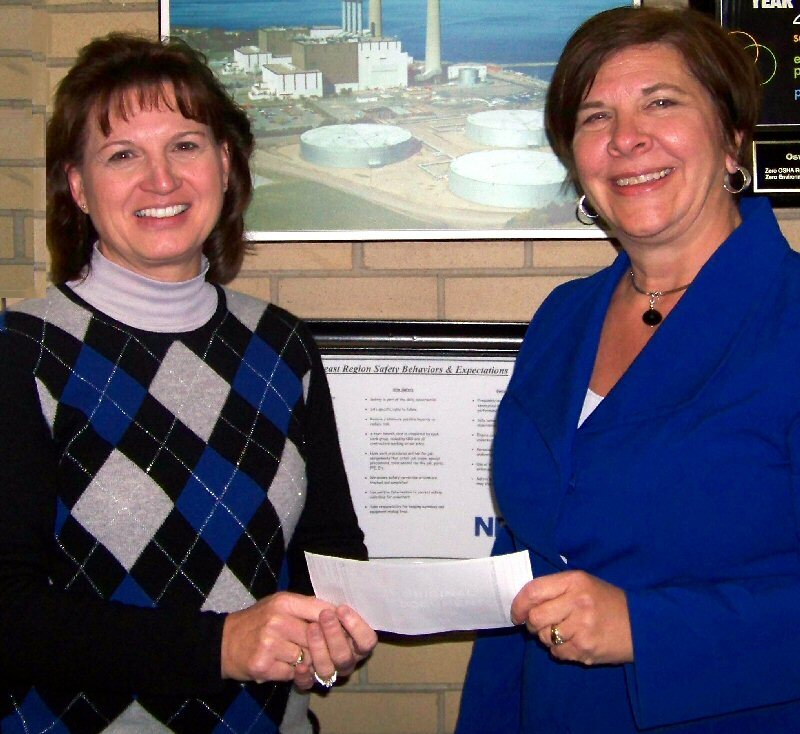 Diane Cooper-Currier (right), executive director of Oswego County Opportunities, is shown receiving a $1,000 “Building Dreams” sponsorship from NRG Energy, one of the major sponsors of the 2012 bowling tournament fundraiser. The check was presented by NRG Regional Administrative Assistant Donna Moonan. “This year’s event was dubbed the “Lucky 13” Bowl-A-Fun because it is taking place on April 13, 2013. Thirteen is usually associated with superstition and bad luck, but we’re turning that around and making it a lucky day, with many chances to win raffles, door prizes, silent auction items, and more!” said Diane Cooper-Currier, OCO’s executive director. The “Lucky 13” Bowl-A-Fun takes place from noon – 6 p.m. Registration is open for five-person teams, with choice of flights: noon – 2:30 p.m. or 3 – 5:30 p.m. (first come, first served). Businesses and individuals are invited to donate door prizes for the raffles and silent auction, and major sponsors are being solicited as well. Homelessness is a growing concern among youth, with a large majority experiencing at least temporary homeless situations before reaching age 18. It is estimated that one out of every 50 American children are homeless each year. OCO maintains a 24-hour hotline for persons experiencing homelessness: 1-877-342-7618. In addition to support for existing services, OCO will set aside a percentage of the Bowl-A-Fun proceeds to build financial resources for the future.